to distract us from tomorrows. where they killed and pillaged. Gary Beck has spent most of his adult life as a theater director and worked as an art dealer when he couldn't earn a living in the theater. He has also been a tennis pro, a ditch digger and a salvage diver. His chapbook 'Remembrance' was published by Origami Condom Press, 'The Conquest of Somalia' was published by Cervena Barva Press, 'The Dance of Hate' was published by Calliope Nerve Media, 'Material Questions' was published by Silkworms Ink, 'Dispossessed' was published by Medulla Press and 'Mutilated Girls' was published by Heavy Hands Ink. A collection of his poetry 'Days of Destruction' was published by Skive Press. 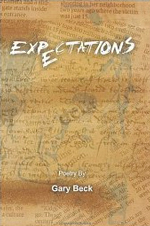 Another collection 'Expectations' was published by Rogue Scholars press. His original plays and translations of Moliere, Aristophanes and Sophocles have been produced Off Broadway and toured colleges and outdoor performance venues. His poetry has appeared in hundreds of literary magazines. He currently lives in New York City.